$10 off Code to get Seventh Generation, Kiss My Face, Burt Bees...etc for cheap! At Vitacost you can get Seventh Generation, Kiss My Face, Burt Bees, Kashi, Annies Homegrown...etc etc at great prices! Even better, use this invitation link to get a $10 off coupon so all you need to pay is $4.99 shipping. 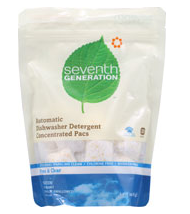 The pictured Dishwasher Detergent is $4.67 so it's basically buy one get one free!! Then make sure to invite your friends so they can get $10 off and if they use your link, you can get $10 off when they make a purchase!